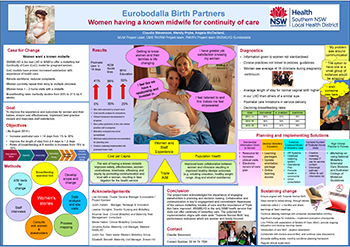 This project developed a new model of care, where pregnant women at Eurobodalla Maternity Service (EMS) were offered a known midwife who was an integral part of their antenatal, birth and postnatal journey. To improve the satisfaction of women accessing EMS and streamline their pregnancy and birth journey. Provides continuity of care to women during pregnancy and birth. Increases satisfaction for women during pregnancy and birth. Improves workplace satisfaction for midwives. Improves physical and psychological outcomes for women and their babies. Reduces healthcare costs associated with delivering maternity care. Providing continuity of maternity care has been a priority of healthcare providers in recent years, as part of a strategy to reduce financial costs to services and help women have a positive experience during pregnancy and birth. Historically, women using the EMS have seen an average of 16 clinicians during their pregnancy and birth journey. This has led to inconsistent care and information offered to women, lack of accountability for staff and increased clinical risk, resulting in dissatisfaction by mothers and midwives. a clinical skills gap analysis. postnatal care was limited to one to two home visits, with no weekend or public holiday service, and no service during staff shortages. The following solutions were developed to provide continuity of care to women throughout their pregnancy and birth journey, in collaboration with general practitioners, obstetricians and specialist obstetric services. Information provided to women during their pregnancy was reviewed and is being standardised, to ensure that it is evidence based, relevant and current. A resource pack is being developed, which will include website links to further information, a ‘when to call’ list for each stage of the pregnancy and birth journey, contact numbers, the NSW Health Having A Baby Book1, the NSW Health Breastfeeding Your Baby2 resource and Eurobodalla Pregnancy Care Guidelines for Women. Antenatal pregnancy visits were increased from 20 minutes to 30 minutes, with staff using the ‘Obstetrix - Considerations and Management Folder’ system to make sure communication and planning was consistent across the service. A clinical practice framework is currently being developed, to ensure clinical practice aligns to current Australian College of Midwives Guidelines3 and Standards4. Clinical competency assessments were introduced for all midwives at Eurobodalla Maternity Service from January 2017, to help midwives deliver maternity care to recognised standards and reduce the need to bring in other midwives or doctors during the care journey. To improve the postnatal care delivered to women, the number of contacts with women was increased to 14 days and the staff roster was reviewed. The checklist used to determine whether a woman should be discharged was reviewed and re-established. Service continuity for discharged patients will be improved through collaboration with the Aboriginal Maternal and Infant Health Service and Community Health’s Child and Family Health Service. A case load model of care will be developed to make sure women can access a known midwife who can identify her individual needs and provide safe and supportive services. An agreed midwifery philosophy of care, vision for the model and ways of working will be developed and incorporated into the model of care, to ensure it aligns to clinical guidelines, protocols and decision-making frameworks. A stakeholder staff communication strategy will be developed to make sure there is engagement and buy-in from the people impacted by the change, including women, doctors and the community. A midwifery staff orientation package was developed to orientate new staff and make sure there is a strong understanding of local processes, to standardise care across the EMS. An education framework is in development, comprising an Excel spreadsheet of education completed by staff and outstanding education they need to complete. This will act as a visual tool for doctors and managers, so learning needs can be quickly identified and addressed. The orientation package and education framework will be incorporated into the clinical practice framework once completed. length and number of postnatal visits. As of August 2017, evidence shows the length and number of postnatal visits have increased by 41 per cent. The stakeholder staff communication strategy has received positive feedback and there is improved staff morale and cohesion across the EMS. Coordination of stakeholders was an ongoing challenge, as each stakeholder had varying demands on their time. These included shift work, working across multiple sites, varying levels of understanding and their expected role in the project. On reflection, communication could have been more appropriately tailored given the wide range of stakeholders. The diagnostics phase of the project proved that health systems can be extraordinarily complex. What the team thinks is occurring may not necessarily be the case. One realisation was that reducing clinical variation leads to efficiency and reduced adverse outcomes. Learning the principles of healthcare redesign was challenging, in terms of placing preconceived solutions aside and trusting the process. This was a great lesson for the team, both professionally and personally. An essentials of care project was developed at the same time as the Centre for Healthcare Redesign project, which added value and significantly improved the culture and communication within the team. Office of Kids and Families. Having A Baby Book. North Sydney: NSW Ministry of Health; 2012. NSW Ministry of Health. Breastfeeding Your Baby. North Sydney: NSW Ministry of Health; 2016. Australian College of Midwives. Standards & Codes. 2017. Australian College of Midwives. Policies & Guidelines for Midwives. 2017. Donnellan-Fernandez R, Newman L, Reiger K et al. Identifying better systems design in Australian maternity care: a boundary critique analysis. Health Systems 2013;2(3):2013-225. NSW Ministry of Health. Maternity - Towards normal birth in NSW. Sydney: NSW Health; 2010. Tracy SK, Hartz D, Hall B et al. A randomised controlled trial of caseload midwifery care: M@NGO (Midwives @ New Group practice Options). BMC Pregnancy and Childbirth 2011;11:82-90.